Natural History Museum of L.A. Minblog: Opening of the MIM museum in Beirut, Lebanon. Opening of the MIM museum in Beirut, Lebanon. Here we were. At the mineralogical event of the year: the opening of the MIM museum in Beirut. I heard so much about the minerals in this collection! At shows, when I was impressed with such or such mineral, I was often told by some dealers: "oh, well, you should see the one from this new museum in Beirut!". Gold from Venezuela? Oh, there is better in the Beirut museum. Jeremejevite? There is better in the Beirut museum. Aquamarine spray? There is better in the Beirut museum. It was going on and on! But what was it about, and who was building this collection? The answer was: Mr. Salim Eddé, chemist, with a passion for minerals. Mr. Eddé is fascinated by these naturally beautiful crystals, which arrange perfectly from the atomic to the macroscopic scale. Minerals which are not only interesting for their aesthetic but also for their use in our every day life: whatever it is, metals, rare earth elements (used in computers, cell phone, etc. ), building blocks, ceramic, name it, minerals were mostly involved in it. 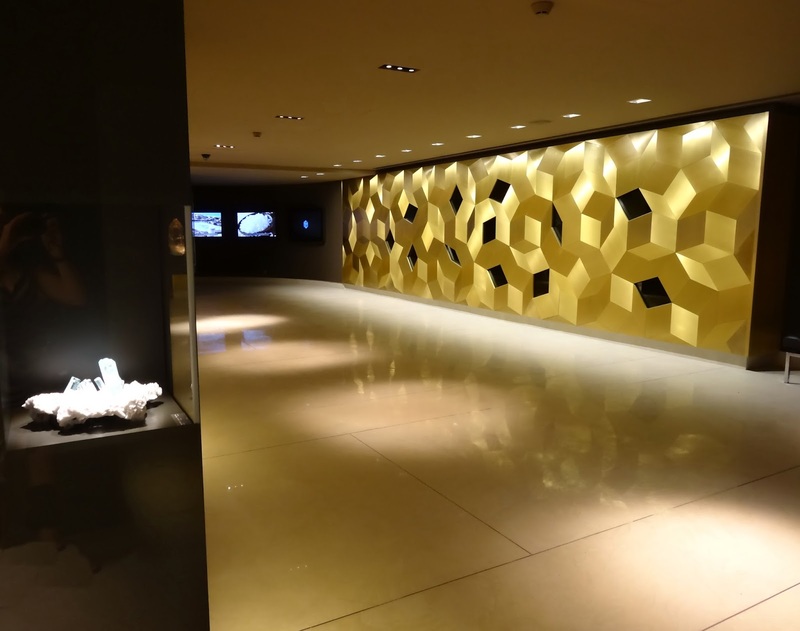 Mr. Eddé wanted to create a museum that was elegant, meaningful, educative, with the main focus being gorgeous minerals. And he did. 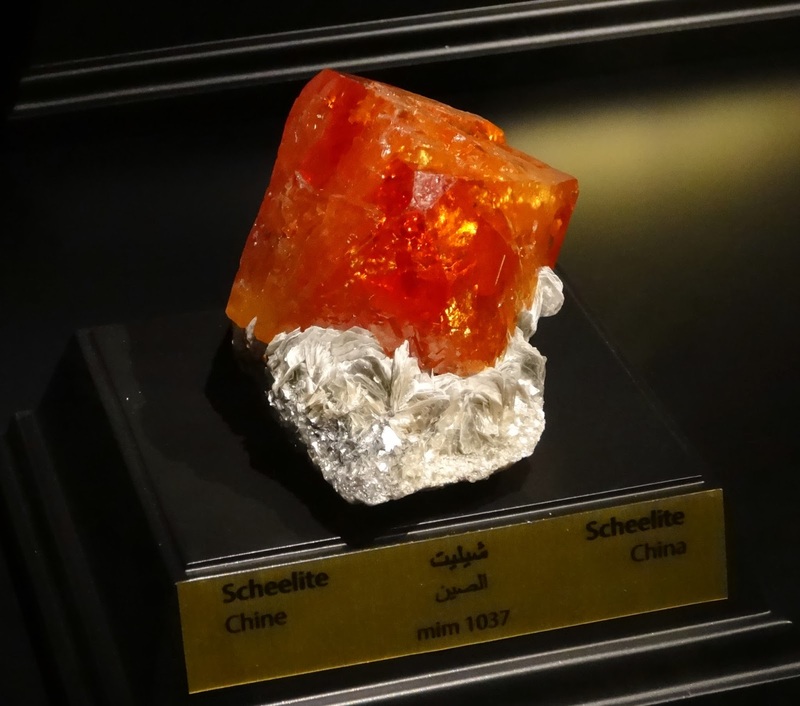 With the help of Jean-Claude Boulliard, curator of the Sorbonne collection (hosted at the Pierre and Marie Curie University in Paris), they gathered over the last 16 years some of the most beautiful minerals. The museum offers a total of 1480 minerals (300 species) from 60 different countries, over 1300 m² (14,000 sq ft) of 9 galleries. As a representative of the USA and of a museum, I have been invited to the opening of the MIM. I would like to share my experience of my few days in Lebanon with you! Leaving Los Angeles Airport of Thursday afternoon, I landed at 10pm on Friday night (October 11th). Right on time to meet with other guests at a dinner organized by Mr. Salim Eddé, in downtown Beirut. Well, it was not a dinner. It was more like a feast! Delicious mezze platters arrived on our table all night long! In the center, Mr. Salim Eddé is orchestrating the dinner. Just not enough room on the table! ... that Daniel Trinchillo from Fine Minerals International really enjoyed! Among guests, Mr. Eddé's colleagues, friends and mineral dealers who supplied some goodies to the museum. Eventually, guests departed to have a good night rest at the Smallville hotel. We were all excited to get up in the morning and have a private visit of the museum! The MIM is hosted at the Saint-Joseph University in Beirut. Mr. Salim Eddé in front of the main building of the Saint-Joseph University. Getting ready for the private tour with Mr. Eddé. To enter the museum, one has to enter the gift shop. The museum itself is located on the basement, by the entrance of the University. One can either take the "mine" elevator (we inaugurated it!) or the beautiful staircase with labradorite walls to reach the basement, where 14,000 sq feet of galleries are. Entrance through the gift shop. Mr. Eddé, in between two pillars decorated with minerals as "amuse-bouches" in the entrance Hall of the MIM museum. The entrance Hall of the MIM museum. In gold on the left, the room with the Treasures are kept. From the main entrance, we enter the gallery area, through an impressive vaulted door. From now on, the visitor is placed in a dark environment, which draws attention uniquely to the minerals. 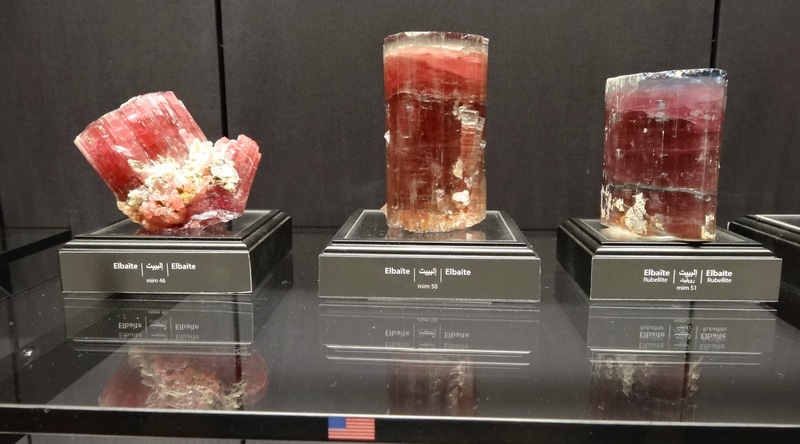 Even if it might be considered as an old fashion way to present a mineral exhibit, it proved many times to be successful (the Sorbonne collection, the American Natural History Museum and our own museum have a similar feel to it). Display cases, backgrounds, ceilings and walls are black. Floor tiles are of a light grey. The lighting used is by fiber optic and spot lights from above the specimens. Talking about light: during our 3-hour visit, there were two extremely short power outages ("It is Lebanon"). But the museum is equipped with its own generator when the general electricity goes off. Oh, did I mentioned that all labels and interactive medias are available in 3 different languages? Yeap: English, French and Arabic! The first room in the vault area has 9 display cases mounted on the wall, containing each a single majestic mineral, representing the 9 classes of minerals following the Dana system of classification: 1- elements; 2-sulfides and sulfosalts; 3- halides; 4-oxides, hydroxides and arsenites; 5- carbonates and nitrates; 6- borates; 7- sulfates, chromates, molybdates and tungstates; 8- phosphates, arsenates and vanadates; 9- silicates. 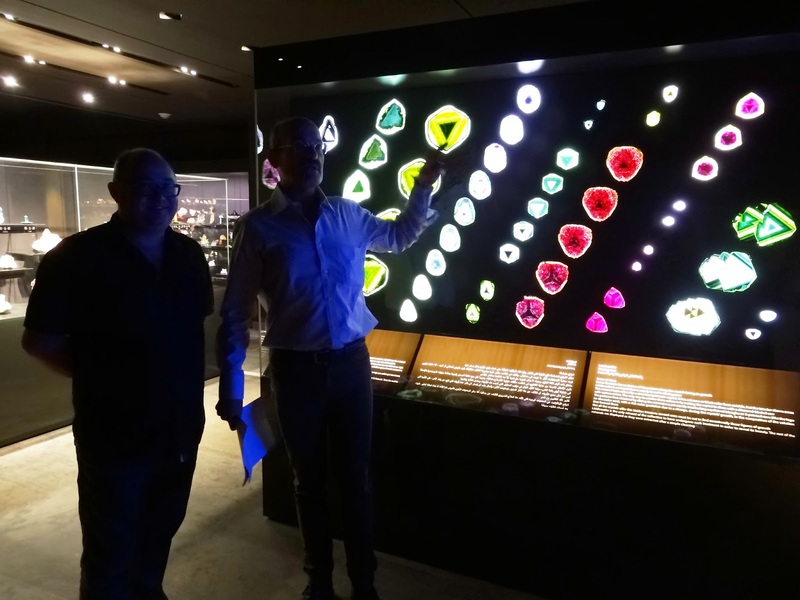 In the same room, one can learn, thanks to a giant, multi-user touch screen, more about minerals and their compositions, and also play with them thanks to 360° images of minerals from the MIM collection. The first room in the vaulted area: 9 minerals from 9 classes. One of the giant multi-user touch-screen. In the second room, each of the 9 classes of minerals is represented by many specimens, beginning with native elements. The display cases with native elements. An overview of the main room. Another angle of the main room. One of the display cabinets: fluorite. Mr. Salim Eddé leading our private tour. Enough talking for the time being, I will let you enjoy a few minerals from the collection. We have many MORE IN THIS ALBUM (click here). 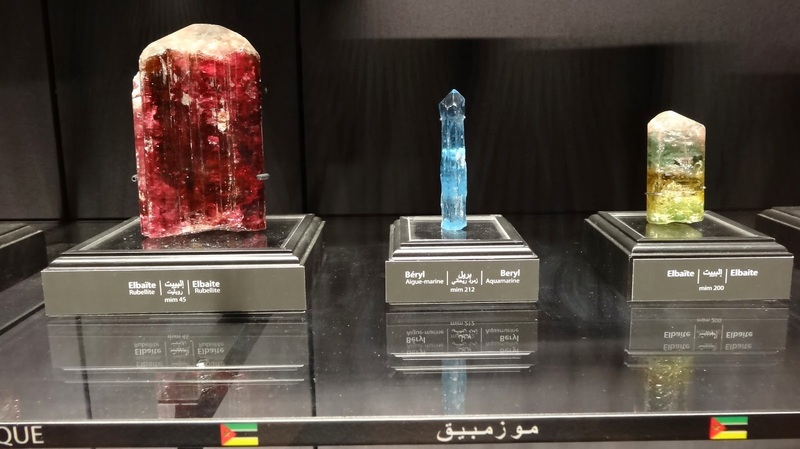 The hambergite from Madagascar (on the right) is just spectacular. A fun gypsum crystal on matrix from Mexico. Or this crocoite from Australia! Vibrant gemmy rhodochrosite from South Africa. A breathtaking collection of cumengeite from Mexico. Pink fluorite from France (a bit of jealousy here again). This fluorite specimen is from China. And yes, of course, there is an app!!! "To break the monotony" of the large display cases full of specimens, a long display case was built on the right wall, with big and impressive minerals. 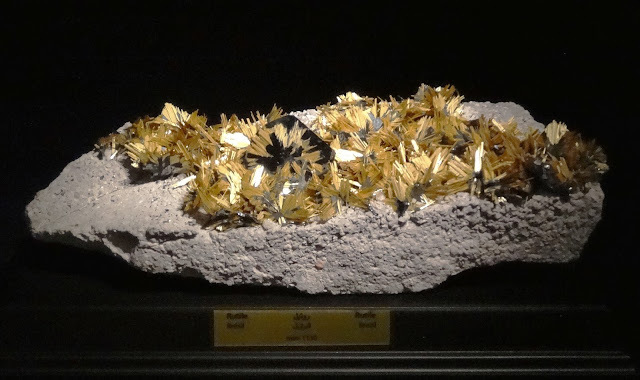 It is the Trophy case, in which minerals are display on black mounts with gold labels. Also known as the Aztec sun. In the foreground: apatite from Portugal. Adjacent to the main room, there is a section for radioactive minerals, that goes along with a video explaining radioactivity. For those who are scared of radioactivity: the room is isolated enough that you don't have to go through it if you don't want to. Clever. Mr. Eddé in front of the radioactive mineral room, presenting the video about radioactivity. After the main room, there is a section dedicated to "localities", with minerals from different countries grouped in different display cases. Again, a giant multi-user touch screen is dedicated to this section, locating mines around the world where the minerals on display come from. Want to step back? Sit down and relax on the Italian sofa! Next to this rather crowded but informative "display of the World", there is the aesthetic display of liddicoatite slices from Madagascar. It's a real eye candy! Mr. Salim Eddé & Laurent Thomas next to some liddicoatite slices. Here, several slices from the same tourmaline are aligned. View of the other side of the liddicoatite panel: singular splendid slices. Laurent Thomas from Polychrom France, who supplied the liddicoatite slices to the MIM, is playing with the interactive interface. The resolution at which the pictures were taken enables to see microscopic features. What a treat! In the darkest room, "la crème de la crème", the most exquisite specimens are displayed. One might even say that this room is similar to the design of our own NHM vault! Instead of gems though: minerals. Some of the descriptions below are from the MIM catalog. Overview of the treasure room. On the foreground: the aquamarine spray from Pakistan (see below for a better picture). Delphine Leblanc is giving the scale as she is looking at this impressive specimen. Of course, one of my favorite, this aquamarine spray from Pakistan. It's gemmy, it's blue, it's aesthetic. One of the most beautiful things I've seen! The longest crystal measures 12.5 cm, while the specimen measures 27 x 25 x 22 cm and weighs 6kg. This gold from Venezuela is the first specimen one sees upon entering the Treasure room. It's elegant and measures (wait for it) 12 x 5.5 x 4 cm. Yes. It is unbelievable! With my point and shoot camera, I never managed to get a good picture of this case! These are emerald crystals, all from Columbia. The crystal in the center measures 8.5 x 6 x 5.5 cm. * Euclase (yes, it is REALLY THAT BLUE!) from Columbia: 4.6 x 3.6 x 2 cm. 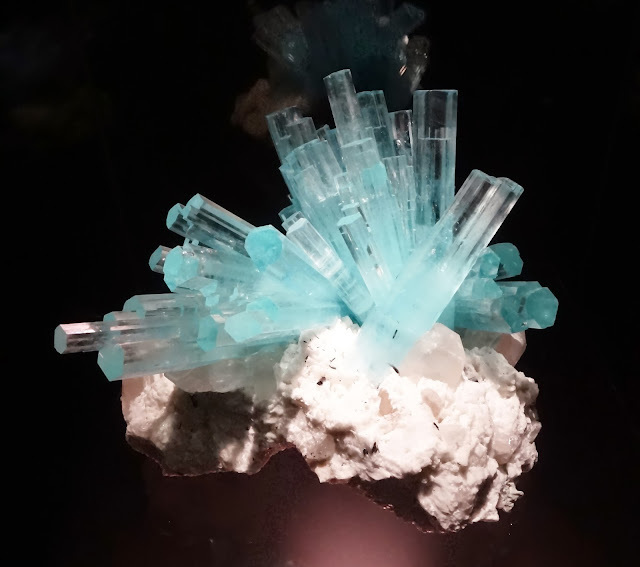 * Aquamarine from Pakistan: perfectly clear crystal on the upper part, with some white inclusions and iridescence on the lower face. This crystal is flanked at the base by a perfect schorl measuring 5.1 cm with tufts of white albite. The aquamarine has a perfect termination rich in faces. * Imperial topaz from Pakistan: Perfectly double terminated, limpid, light champagne-colored crystal, brilliant and rich in facets, flanked by an altered green fluorite crystal with strips of albite, the whole on a base made up of a smaller, almost colorless topaz crystal. Cerussite crystal displaying an amazing dispersion. It is an intact, transparent and colorless twinned crystal, in a heart shape and giving a rainbow effect, on reticulated cerussite crystals. It measures 7.5 x 7.5 x 10.5 cm. Gold from Mockingbird, California. The gold sheet is made of small, brilliant, sharp-edged hexoctahedrons and dendrites. Three gold specimens from Mocking Bird, California. Tanzanite crystals, showing a striking trichroism (the display is well-done enough to see it!). The elongated crystal measures 14.5 x 5.5 x 3.5 cm and the one on the right is 10.5 x 9.5 x 5 cm. Fluorite from Illinois, USA. This fluorite specimen has two interpenetrating crystals (probably twinned) of a vivid orange-amber color, lustrous and rather transparent with smooth surfaces; growth of small fluorite cubes on some faces. It measures 8.5 x 7.5 x 6 cm. Another eye candy! What amazing colors in this display case. 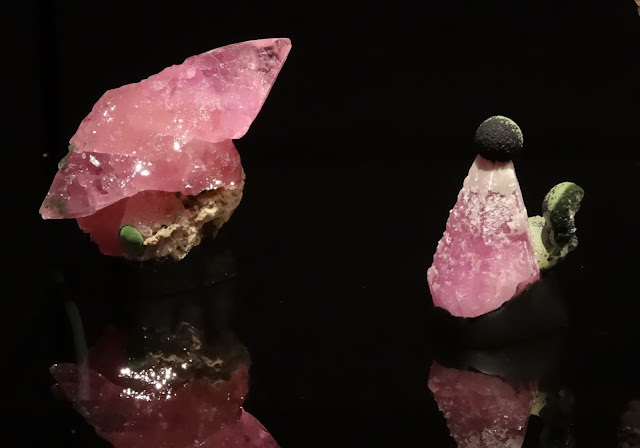 *Pink: Pezzotaite from Madagascar, measure 7 x 6 x 3.5 cm. 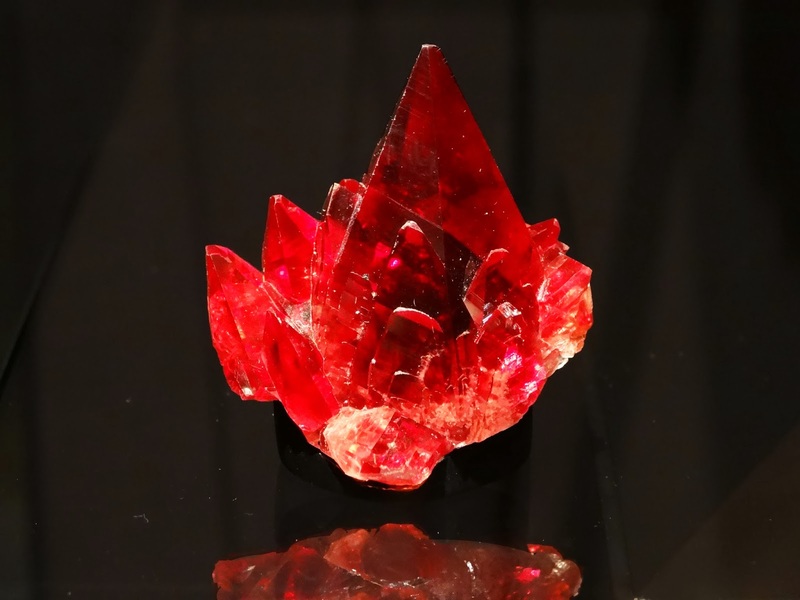 *Pinkish-red (in the back): double transparent crystals of Rubellite in a V shape, measuring 13 x 5 x 3 cm. *Yellow: Heliodore from Russia, measuring 12.5 x 3 x 2.5 cm. It i s a perfectly hexagonal, transparent crystal in a beautiful yellow-amber color with small corrosion patterns on the faces. The summit is very well crystallized. *Green: Peridot from Myanmar, measuring 6 x 4 x 3 cm. 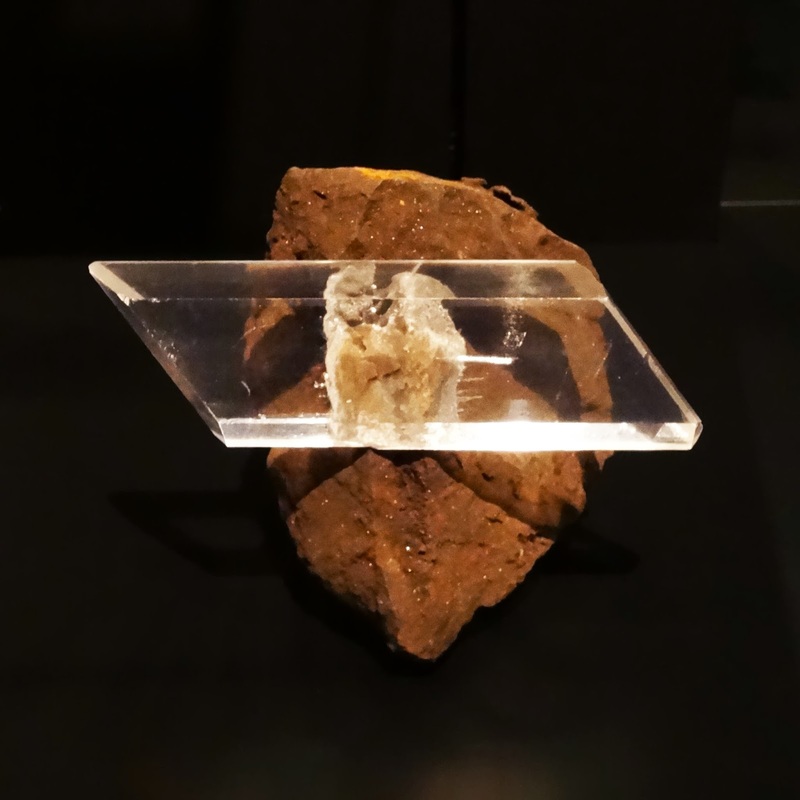 It is a well terminated, entirely transparent crystal with the bottom apparently recrystallized, some naturally corroded faces and others very smooth, without inclusions and of a beautiful greenish-yellow from a front view and a more frankly green profile. Three imperial topaz from Brazil. The longest crystal (right) measures 9 x 3.5 x 2 cm. Another great display, dedicated to corundum display cases. In the front, you find two large sapphires from Sri Lanka. They are un-tumbled, very sharp-edged and translucent double terminated crystals with a pale blue center and yellow ends. The right one measures 11 x 5.5 x 5 cm and the left one 9.5 x 4.5 x 4 cm. Kongsberg silver measuring 15 x 10 x 4 cm. You will probably recognize it from the "World's Mineral Masterpieces" book. Some calcite crystals are intertwined in the silver wire. I hope you enjoyed this tour of the museum! Yes, it is a lot of minerals... And I've shown only a few. Now that we were spoiled with a private tour before the opening, it is time to officially open the museum! On October 12th, 2013 at 6pm was the start of the ceremony. The Lebanese President, Mr. Michel Sleiman, officially announced the MIM museum open. After short speeches (including one in 3 languages by Mr. Eddé...), a light and sound show was projected onto the wall of the main University building. Hors d'oeuvres were served around "mineral masterpieces" made out of sugar or polyester! Absolutely gorgeous (to look at and to eat). Mr. Salim Eddé delivering his opening speeches. They were greatly received by all! The light and sound show (ok, you have just the light here. I promise, I will add sound soon!). The glass fluorite model, in front of the gift shop, by the entrance of the MIM museum. I assure you: President Michel Sleiman was there! From left to right: Wayne, Alexis, Delphine, Chris and Daniel. From left to right: Laurent, Isabelle (Mr. Eddé's sister) and Brice. Wayne Leicht & Salim Eddé. I took only a few pictures at the beginning of the night. But again, Mr. Eddé surprised us with this fabulous place. Everybody was ready to party pretty quickly and for quite a long time! Gene, Delphine, Wayne & myself. From left to right: Salim, Carole, myself and Gilles. The curators: here with Raquel Alonso Perez from the Harvard Museum. Mr. Salim Eddé rocking the party! I didn't have that much time to visit Beirut, but here are a few pics, while on our way to the marina. A few buildings show signs of wars, with walls riddled with bullet holes. However, most of the town is getting re-built, with extraordinary buildings such as those, next to the marina. On the Sunday, we decided to head out to Byblos. In a 40-min cab ride (over an hour on the way back), we were there. We learnt that a 2-lane road means that you can probably fit at least 3 or 4 rows of cars. Anyway, we arrived at our destination, all safe. And it was worth the trip. Next to the Mediterranean, Byblos has preserved centuries, even millenia of history. Possibly, the first inhabitants lived in Byblos between 8800 and 7000 BC, and was built by Cronus as the first city in Phoenicia. It is believed by many to be the oldest continuously-inhabited city in the world. Byblos: a mix of ruins from different millennia. Blue eyes, Fatima hands and the Madonna. With all of that, we will have enough luck in our luggage to bring us safely home! You said what? Free beer?! From left to right: Delphine, Raquel & myself. I would like to sincerely thank Mr. Salim Eddé for his invitation to come to this very special event. It is truly a remarkable museum, that I hope many international visitors, as well as locals, will have the chance to see. May Lebanon get better every day, and this museum is definitely a great step forward. In the meantime, I now can say it is a beautiful country with very welcoming people. I could go back in a heart beat! Thanks also to Carole Atallah who helped coordinating my trip there. Suzy Hakimian, you have a wonderful collection in your hands, we are all jealous! All the best to the MIM museum and to Lebanon! Layla Khalaf-Kairouz, Environmental Geology...Notre Dame University-Louaize. Great report! Thank you very much for this page, the pictures and the comments. I am just new in this field as I started studying gemmology in September. I was wondering if there was anything like a museum or a show or a fair in December as I will be there for Xmas and talaaa! I found your page and I am now really looking forward to visiting the MIM. Indeed it feels good to see that some people are still doing beautiful things in Lebanon these days. 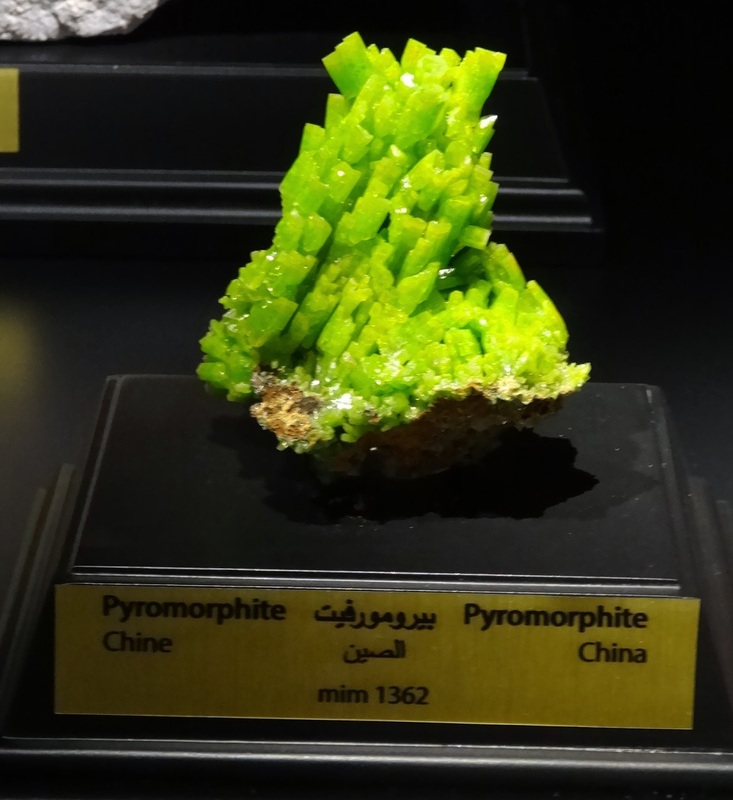 Hearing about exploding bombs and killings in the Lebanon it seems unbelievable that they have such a wonderful mineral museum. A reason to visit Lebanon against all odds. Thanks for the wonderful pictures which proof that there is more in this country as civil war, bombs and terrorists. Well to say it with Rock Currier - crystals not pistols ! Unfortunately I could not attend the opening; but, just by looking at this beautiful report I could see the incredible level of the specimens. Impressive collection and beautiful Museum. My deep compliments to Mr. Salim Edde. Just how stable is Lebanon considering what is going on in neighboring Syria and other nearby areas ? I have this awful vision of this beautiful museum being destroyed like so many other places in this war torn region,.